Now known as Mysuru, this is one of the most famous tourist destinations in South India. With a rich and royal heritage, people flock to this city to get a glimpse of it’s beautiful palace and many beautifully designed temples and buildings. Mysore was the capital of the Wodeyar dynasty and also the home of the famous Tipu Sultan and Hyder Ali. Mysore has many palaces, gardens, and museums for those who are fascinated by history and many beautiful temples with rich histories of their own. Visiting Mysore is surely a treat and you would have an unforgettable experience in the Palace City of India. One of the famous Shakti temples, dedicated to Durga, Chamundeswari is an imposing and beautiful sight to behold. 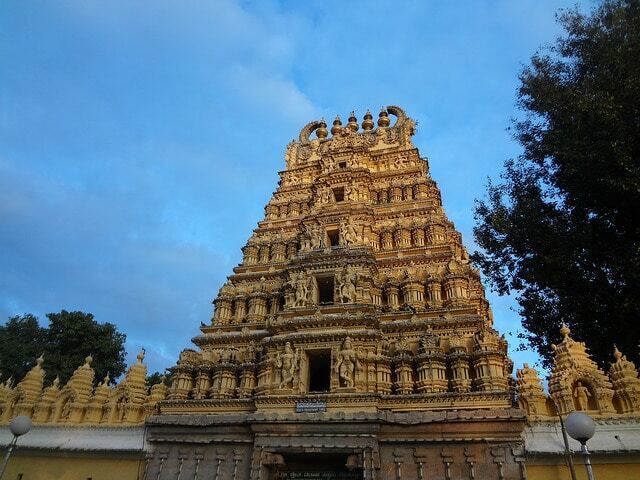 The temple is located on top of the Chamundi Hills and is very ancient. The original temple was thought to have been built during the 12th century. The famous Nandi statue is a short walk away and is located on top of the 1000 steps built in the 17th century. The temple has beautiful statuettes and carvings all over and makes for a wonderful building aesthetically. Said to be made out of one big rock, the Nandi statue is a statue dedicated to Nandi, who is lord Shiva’s mount. 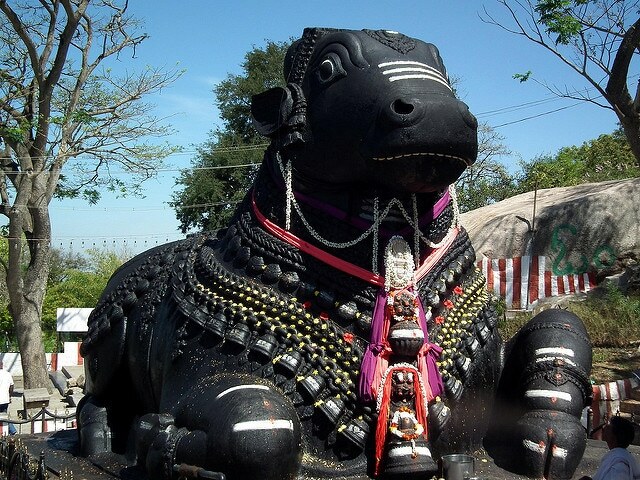 Also known as the Bull temple, it is located on top of the Chamundi hills. The statue is almost four hundred years old and was commissioned by Dodda Devaraja Wodeyar. The Nandi statue is the third largest in India. The temple is right behind the statue and is dedicated to lord Shiva. Every temple dedicated to lord Shiva has a Nandi image at the front. The statue is intricately made and is a beautiful sight to behold. The Gayathri temple was built by the last Maharaja of Mysore, Jayachamaraja Wodeyar, during 1953. He dedicated the temple to Goddess Devi and had three shrines built. The shrines are to Savitri, Gayathri and Lakshmi. The statues in the temple are of Lord Ganesha, Shiva, and Vishnu. One of Mysuru’s most famous sculptors was tasked with building the idols and they surely are very beautiful. 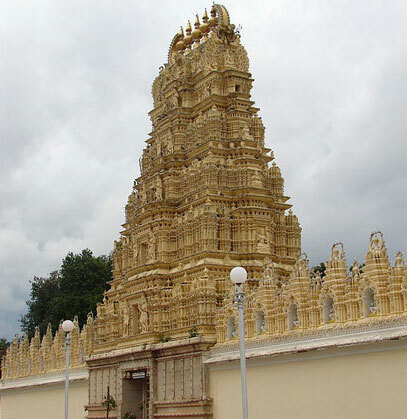 The temple is situated in the Mysuru Palace premises and is one of the many temples there. 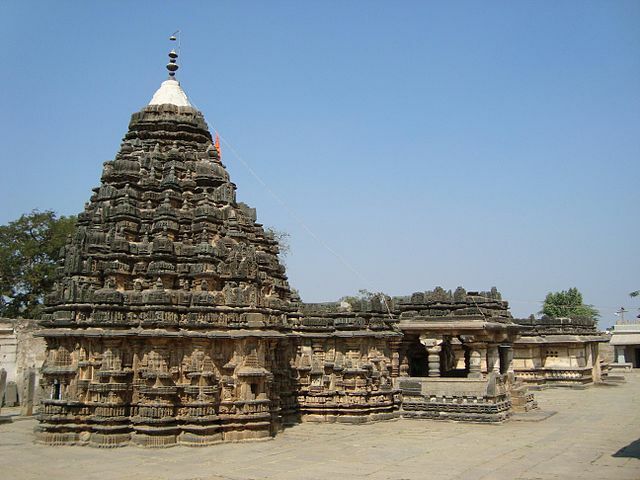 Built by the Wodeyars during the 13th century Someswara temple stands tall just north of the Mysuru Palace. Famous for the many pujas that were held by the rulers of Mysore, this temple is regal and has a beautiful facade. An ancient temple, this is a must see for those who are interested in the history and it is sure to fascinate people who are not as historically inclined. The temple has three shrines, dedicated to Shiva, goddess Somasundari, and lord Narayana. The Shivlinga is said to be ancient while the other two idols are more than a century old. For those going during Dushera, you are sure to enjoy the temple during the festivities. 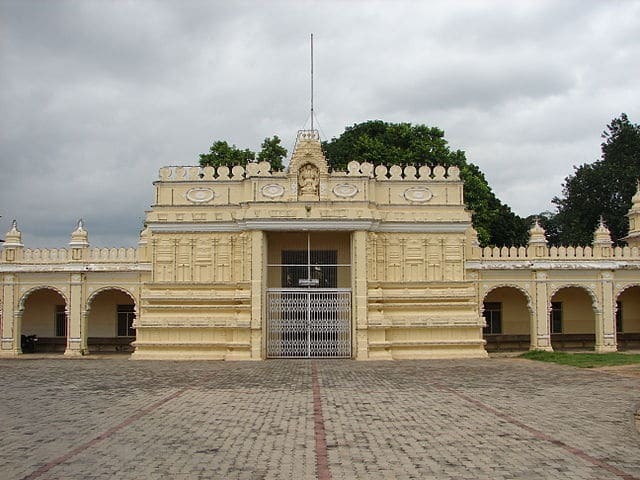 A relatively new temple, built during the 1950s, Bhuvaneswari temple is dedicated to Goddess Bhuvaneswari. This temple, like most temples in south India, is built in the Dravidian style. It has a tall and flat incline which is quite wide. This allows for intricate detailing of the facade, where many people carve statuettes and other various carvings. His Highness Jayachamaraja Wodeyar is said to have given the temple the large copper Surya Mandala which is one of the main attractions at the temple. During the first two months of the year there is a special prayer given at the Surya Mandala, which is a must see. Mysore, the Palace City, has a charm that you will not find anywhere else in the world. With its rich cultural history, you are sure to be fascinated by the regal Mysore. The temples around Mysore are testaments to the power and the riches of the Wodeyar Dynasty and how even the rich and the powerful are humbled by God. The temples are beautiful and are the windows into Mysuru’s soul.